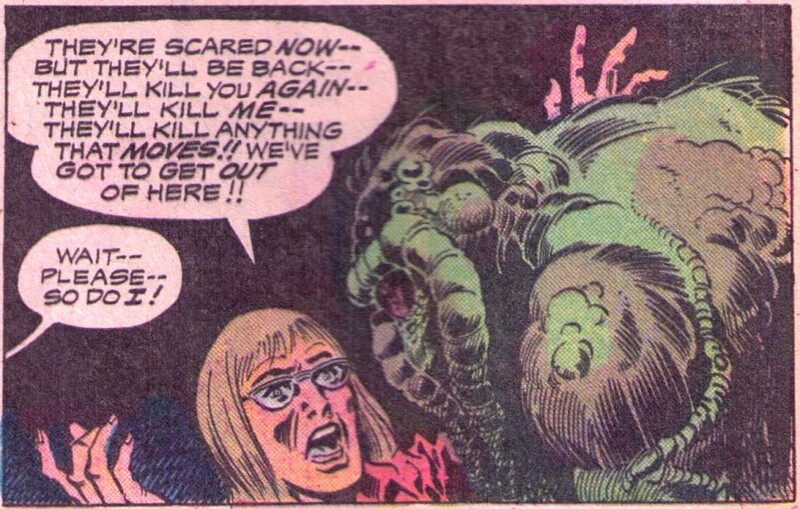 NOTE: This is the fourth part of a multi-part series of posts examining Steve Gerber’s final arc on the 1970s Man-Thing series. If you prefer to start from the beginning, you can go to Part 1 here. Let me tell you a tale of a comic book with three titles. In the previous issue, the title of the next installment, Man-Thing #18, was said to be “…Against the Dying of the Light!” The cover of the actual issue declares, “Chaos on Campus!” And the opening splash of the issue says, “School’s Out!” Now I’m going with the latter because I’m guessing this was Gerber’s final decision on the story title; and also because it was a contemporary reference to an Alice Cooper song that I happen to enjoy. That next-issue blurb in issue #17 also promised us “a fear-fraught finale–and a startling new beginning!” On these counts it certainly delivered. We pick up right where we left off, with Olivia Selby and the Mad Viking leading an angry mob to the high school to burn books. Chants of “burn the filth!” are interspersed with the singing of “Onward Christian Soldiers.” Kids in the school (one of whom is Carol Selby, Olivia’s daughter) are dismayed by the mob. The principal steps outside to see what’s going on and gets pasted by the Mad Viking, who then leads the mob into the school. Back at the auditorium, Richard Rory awakens to the sound of his radio-station boss informing him (rather loudly) that he is fired. Once Rory learns that the mob has gone to the high school, he rushes out, hopeful that the group can still be reasoned with somehow. Now we go to Blackwater Creek. Here, Gerber gives us “a bit of local color,” as he tells us of the creek’s history, which also serves as a rather progressive ecology lesson. Apparently the creek was once a quaint little fishing hole until a local plastics factory started using it as a dumpsite for their chemical waste. Rather than evict the plastics factory (and its 600 jobs), the city proposed a bond issue to finance a sewage treatment plant. Since this all took place back in 1969, when “nobody even knew what ‘ecology’ meant,” it took three years to pass the bond issue (that would be 1972). Then, by the time the treatment plant was actually built, all the fish in the creek had died and the creek itself was basically a poison river. Why is Gerber telling us all this? 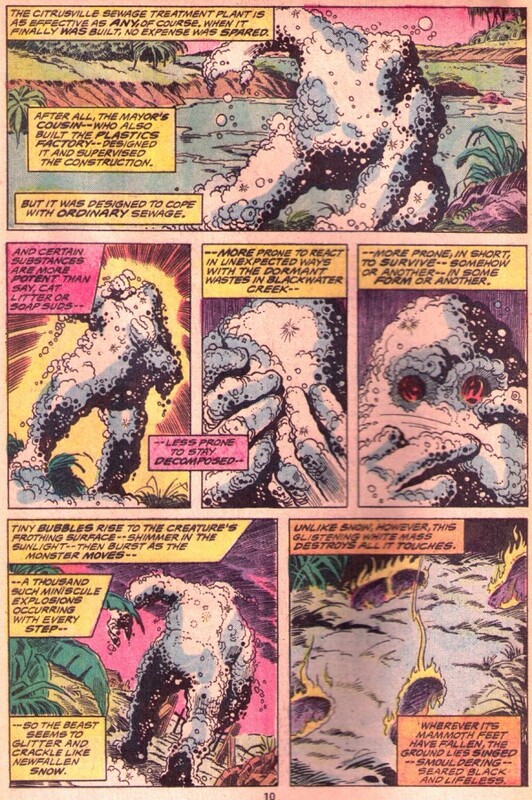 Oh yeah—because there’s this giant pile of sudsy-something shaped kinda like the Man-Thing shambling out of the creek. Ah, how could I have ever thought that the Man-Thing met his maker in the previous issue? Did I really believe that the forces behind the Nexus of All Realities would allow their guardian to die in a cheap sewage treatment plant? (Alright, so not really.) In any event, Manny’s back in one piece and marching in the direction of Citrusville High. Meanwhile, Olivia Selby and her mob are tearing the school apart, seemingly aiming to gather up every last book in the joint. Carol implores her mother to calm down with the classic teenager’s plea, “you’re embarrassing me!” Olivia tells her daughter that the kids there will one day be thankful for her “saving them.” She then accuses Carol’s biology teacher of being a “degenerate” and an “atheist” before the Viking promptly throws him out the window. (As we established back in issue #16, defenestration is one of the Viking’s favorite hobbies.) Rory arrives just in time to see the teacher crash through the second-floor window and hit the ground. Back on the edge of town, Man-Thing (or maybe we should still be calling him “Suds-Thing” at this point) is on the move. The yokel who had that bright idea to dump him in the primary vat last issue (his name is actually Orville) spots Manny and tries to run him down in his jeep. I don’t suppose I need to tell you how unwise a decision this was. Orville’s head winds up going through the windshield. Couldn’t have happened to a nicer guy. At the school, the mob is building a large pile of books out near the school entrance as a feminine hand finds Richard Rory’s shoulder. It’s Astrid, who quickly informs Rory of her relationship to the Viking. Rory convinces her to try and talk some sense into him. Then at last, the Man-Thing arrives. The Man-Thing’s sudsy exterior is transferred to the Viking, who is completely disintegrated by the awful chemical foam. The crowd flees in a panic. And once again, Richard Rory provides a welcome breath of comic relief in the wake of all this. The half-shadowed faces of the three characters gives the impression of them being swallowed up by dark, sinister forces. Perhaps the intended implication is that this is a tipping point in the story; the point at which any chance for a peaceful resolution to the proceedings has passed. In addition to the wide eyes and gaping mouth, one can easily imagine Rory’s gesticulations here as he attempts—despite all the obvious futility—to reach the Man-Thing on any kind of rational level. Overall, this is just great work; a great collaboration between Gerber & Mooney. That’s two issues of stunning quality in a row. 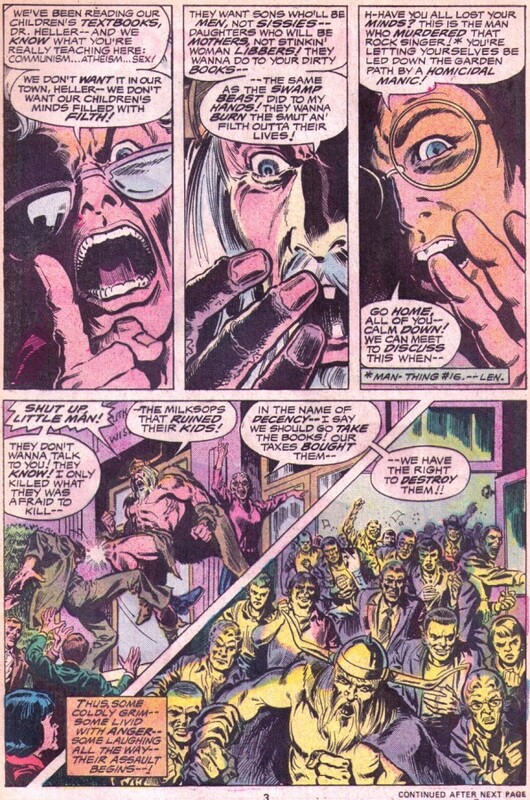 There is another area where Steve Gerber earned some bonus points here: He was in many ways a prophet with this story. First, on the issue of the ecology, Man-Thing #18 was cover dated June 1975—three years before the story of Love Canal broke big in the national media. So what Gerber gave us in terms of social commentary with the fictional background of Blackwater Creek was clearly way ahead of the curve. Then there’s the incredible flip-flop of the Citrusville residents in regard to the Mad Viking. Now I’m sure there are a lot of people who would deride this as not “realistic” (more on this word later), but putting realism aside and looking at it symbolically, Gerber once again looks quite prophetic. For context: this issue came out in the spring of ’75, less than a year after Nixon left office in disgrace. I was a kid then, but old enough to have picked up on the general tenor of political chatter at the time, and let me assure you, few people believed the Republican Party would ever be the same. The notion that they would rebound at all, let alone come to dominate the White House again within one presidential term, would have been considered outrageous. Yet it happened. So is it realistic that the people of Citrusville would embrace a homicidal madman dressed up like a Viking just hours after chasing him through the streets? Of course not. But does it work as a symbolic story, one that forecast the mass right-wing hysteria that would eventually swallow up our entire modern-day political climate? You tell me. Speaking of the Mad Viking… in my review of issue #16, I touched on the Viking’s legacy—specifically, his fear of leaving none behind. This issue expands on that theme splendidly. 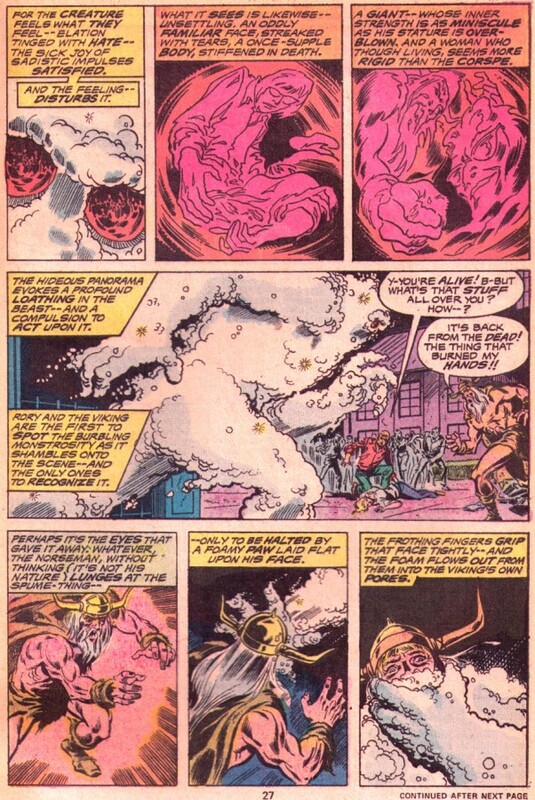 Even after the Man-Thing burned his hands, even after the murder of Spangler turned him into a hunted fugitive, the Viking refuses to abandon his crusade. He is determined to leave his mark on this world by forcing it to embrace the values he has always held. This is to be his legacy. The pathetic part is that he already has a beautiful legacy in his granddaughter Astrid—but this legacy isn’t glorious enough in its masculinity for him. When given a choice between the two, he destroys his real legacy (Astrid) to continue the pursuit his fake one (the masculine ideal). Astrid was not only beautiful and kind, but also strong and brave. She had the chance to escape, but she stayed in Citrusville and even confronted her grandfather in an attempt to put an end to all the madness. Most of us would be happy to leave behind such an extraordinary human being as our legacy, but the Viking destroys it by his own hand. This makes his ultimate fate perfectly poetic. He is dissolved completely—just as the Man-Thing appeared to be at the end of the previous issue, only the Viking’s not a swamp monster created via some strange synthesis of science and sorcery like the Man-Thing. So we know he’s dead and not coming back, ever. Every bit of him is gone; every part, all the way down to that goofy, horned helmet of his. There is literally nothing left of him; his legacy is reduced to literally nothing. Then we have Olivia Selby. As I mentioned last time, Olivia really rubbed me the wrong way when I first read Man-Thing #17, though I couldn’t explain precisely why. Of course, I was still in the single digits then; I believe I’m a bit more eloquent now as a quasi-adult. What I felt then but couldn’t put into words was this: Olivia seeks to do more than just protect her daughter here; she seeks even more than to merely control her. One gets the feeling that even if she could somehow control all the children in Citrusville, or even all the children in the world, it wouldn’t be enough. At her core, Olivia has this mad impulse to control absolutely everyone and everything, to the point of not allowing anyone else to think for themselves. This is the true evil of censorship. Gerber kinda went over it with a yellow-highlight marker (and then underlined in red ink, lest anyone miss the point) when he had Olivia tell her daughter, “I done the thinking for both of us, Carol– like always.” But in this case, I don’t mind Gerber being obvious. There were still mostly kids reading comics back then, and this was too important a message for them/us to miss. By story’s end, Olivia reveals her true colors when she flees with the rest of the mob after Man-Thing has wiped out the Viking—leaving her daughter Carol behind, seemingly without a second thought. So much for her “protective” urges, huh? When I reviewed “The Kid’s Night Out!” last week, I included an excerpt from a Foom interview with Gerber, wherein he stated that these last two issues of Man-Thing “were in a sense an apology for that story [“The Kid’s Night Out!” from Giant-Size Man-Thing #4]. 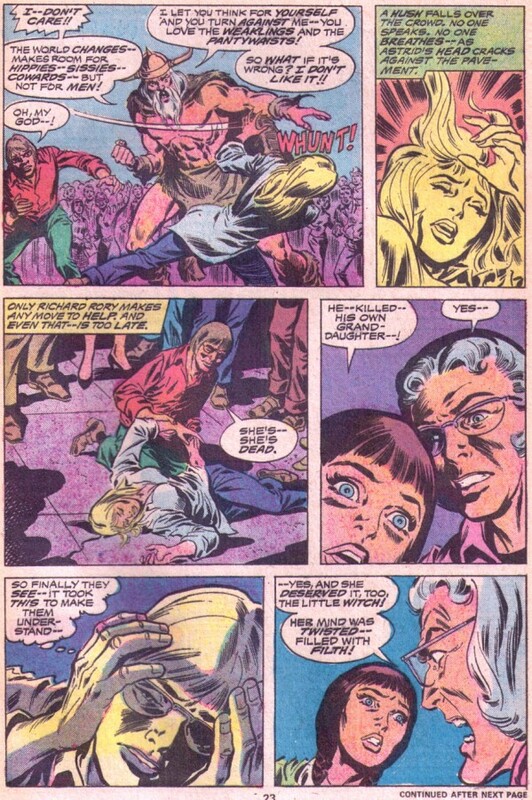 An apology for myself.” (Foom #9, March 1975, p. 30) I think what Gerber was saying was that he recognized the weaknesses in the former story and sought to correct them in these last two issues. So how is this storyline an apology for the previous one? And how, exactly, did this last two-parter correct the weaknesses in Giant-Size Man-Thing #4? Don’t both storylines end with Man-Thing coming in and rather simplistically cleaning house? Well folks, the difference is really all about how we got from Point A to Point B. In “Kid’s Night Out,” we started out with a cast of ostensibly realistic characters struggling with a real-life issue (bullying), but these characters quickly devolved into caricatures. In the case of Man-Thing 17-18, Gerber took the opposite route. Here, we start with caricatures but they become characters as the story goes on. As characters, Olivia and the Mad Viking are fairly ridiculous at first, but then we pull back a bit and reveal some of their motivations and are surprised at just how human they are. Both characters are really just afraid. The Viking fears dying after having lived a wasted life, and Olivia desperately fears losing control. Most of us carry these same fears, to one extent or another, at various times in our lives. The people of Citrusville were all also behaving insanely, of course. The prime example is their sudden embracing of the Viking after hunting him through the streets like an animal just hours earlier. Now this is certainly outrageous when viewed literally and realistically—and could be viewed as sloppy writing if Gerber’s intent was pure realism, but it’s clearly not. The madness here is all intentional, all of it by design, as evidenced by Rory’s observation in issue #17: “Th-this can’t be happening! Two days ago, this town was sane!” This is followed by Gerber’s own narrative observation: “It’s hardly the first time a maniac has been thus revered”—a clear allusion to Nazi Germany. So are the townspeople also over-the-top nuts? Yes. But putting aside presence of crazy Olivia and the Viking (who is more a symbolic figure than a literal one anyway, as I’ve previously detailed), is the crowd’s extreme behavior that improbable? Gerber just gave us the best historical example of where we’ve seen similar, real-life behavior before. So while the mob’s actions may be insane, it’s also true that angry mobs do behave in an insane manner from time to time. The fact that the residents of Citrusville have several opportunities to retreat from this madness, to abandon this road they’re on, and still fail to do so only makes the story more powerful. Their last chance, when they proceed with the book burning even after the Viking has killed Astrid, rings chillingly true. Sometimes a person or group goes so far down a road of insanity that there is no turning back, because turning back would require facing the atrocities one has committed. It’s far easier to simply plow forward in the same direction and tell yourself what you’re doing is right. The ending here is also not nearly as simplistic or neat as the one in “Kids.” Yeah, the Viking gets what’s coming to him, but has good really triumphed over evil? Ultimately, the ugly, rotten core at the center of this seemingly nice town has been revealed and can never be unseen. There can be no pretending otherwise. The only course of action left for Rory, Carol, and the Man-Thing is to get the hell out and never look back. Very thoughtful reviews. I was 12 when these issues came out and while I did get at least a few issues Manny’s appearances in both Fear and Man-Thing, i missed these particular issues, but filled in the gaps much later. I’m a freethinking and voracious reader of both fiction and non-fiction, with points of view that would have gotten me thrown out a window or strung up if Olivia, the Mad Viking and their mob had gotten hold of me. I loved Gerber’s writing for it’s mix of outrage at real horrors and strong sense of absurdity. Sure, this story goes over the top, but on the other hand the horrors that overtook much of Europe between 1939 and 1945 due to one miserable misanthropic art school reject and his mob would have seemed utterly preposterous if it had been told as a fictional story in 1910. Just as it would have seemed ridiculous at the time to propose that a Georgian communist gangster would take over the world’s largest nation within 15 years and within another 20 impose his will on much of the remainder of eastern Europe. And now we have a ridiculous man-child mis-ruling our own nation. It’s absolutely startling how prescient Gerber was. The fact that the issues he addressed in his 70s work are so relatable today is probably a big reason why his comics remain so readable.